Even after many years of offering the epoxy garage floor covering service, we still call it magic. Because it's impossible not to be amazed at the before and after difference every time a floor painting project is finished. And when you see what a couple of coats of epoxy paint and sealer can do to any ordinary (or even ugly) garage, you too will agree that it's quite a magical transformation! Painting a garage floor is usually the last thing on people's minds. 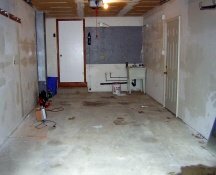 As a result, even in the most beautiful homes, a garage is often considered the owners' dirty little secret. Too bad, because a clean garage adds value to a house and is a great selling point - maybe because it's so rare? 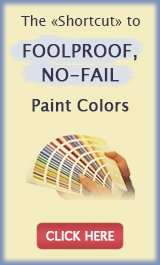 Why Paint a Cement Floor? 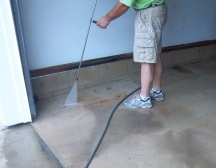 When garage floors are neglected and left untreated, the porous surface of concrete absorbs oil, dirt, water, grease and other contaminants, and looks chronically dirty, no matter how much you sweep, wash or powerwash it. 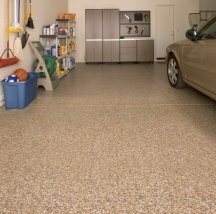 An epoxy garage floor covering will protect the concrete from automotive fluids and resist salt, gasoline, oil, antifreeze, grease and most other household stains. 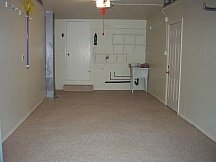 Garage floor epoxy coatings will create a durable, attractive, easy to clean finish and turn any ordinary garage into a show place. 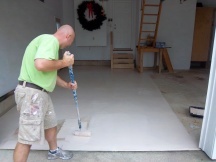 Before painting a concrete floor, it must be thoroughly cleaned and power washed with special cleaners and acids. This step is important because some contaminants may repel the paint and not let it bond with the concrete properly. 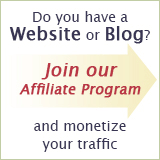 The floor must be allowed to become completely dry before proceeding with the paint - at least 24 hours in dry weather. 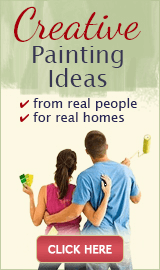 It's a crucial condition for paint adherence (moisture is paint's worst enemy). Next, 2 coats of the base coat are applied with a roller and brush, with 8 hours in between the coats (so usually one coat per day). If rushed, the paint may never dry properly and remain tacky. The most popular colors for garage floors among homeowners are tan and gray, but more exotic options like red, blue or green are also available. Some people prefer this solid color look, while others choose to sprinkle the floor with decorative flakes for a granite or terrazo effect. The job is completed by applying 2 coats of clear epoxy floor sealer to seal in the flakes, add durability to the finish, and give the floor that deep luster look of stone. After this final sealer step, the coating must be allowed to cure for about 2 weeks before putting the car inside, otherwise you risk stripping off the paint or marring the finish. Funny fact: most homeowners love their brand new epoxy garage floor covering so much, they want to let their guests in through the garage! 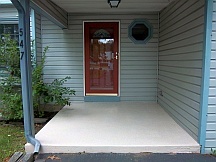 But you can always paint your cement porch too, and use it for its intended purpose. 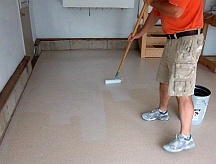 Epoxy floor coatings also work great for painting basement floors, as well as the concrete floor in your laundry room, mudroom or shop.